Arbor Hills Landfill, a mainstay since the 1960s, continues to grow, but concerns have grown, too. (WXYZ) — As Debbie Brown walks across Thayer’s Corner Park in Northville, she’s quick to point out the foot traffic the small neighborhood park gets. 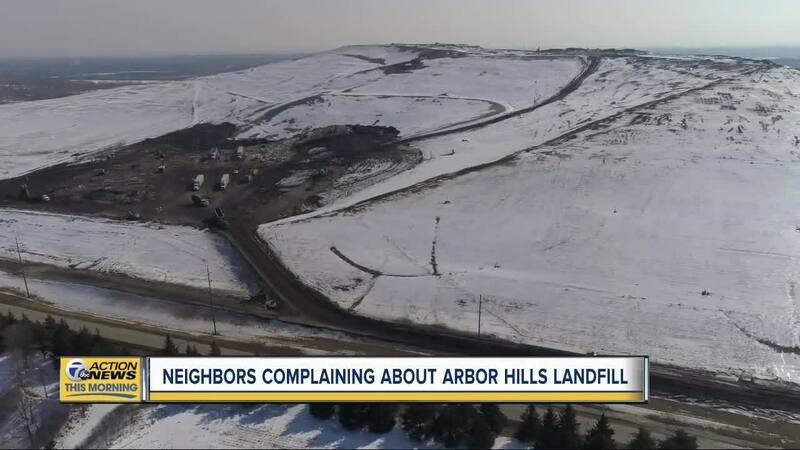 During spring, it’s a hot spot for gardeners, but the sight just off in the horizon makes Brown cringe: Arbor Hills Landfill, a mainstay since the 1960s, continues to grow — but Brown notes the concerns have grown too. “Lansing needs to get their butts in order and help us out here,” she says, breaking stride before pointing out the place strawberries will be grown in a few months. The irony is that the company that donates the compost is prominently displayed with a sign: Advanced Disposal Services, the same folks who run the landfill a stone’s throw away. ADS contends that they’re working hard to improve issues recently flagged by the Michigan Department of Environmental Quality (MDEQ). Violations have piled up in recent months — three since the start of the new year. The issues range from odors to the handling of wastewater and the amount of sulfur dioxide that reaches the air. Some of the issues have already been addressed, while others require a response from the company within the next few weeks. While ADS acknowledges the odor issues that have led to hundreds of complaints filed with the MDEQ in the past year, they continue to state that they’re part of a fix to the problem — not a new issue with the landfill. ADS took control of the gas collection system at the landfill back in 2017, it previously was owned/operated by a secondary company. The gas created by the landfill is collected and sent to a third company, Foristar, which burns the gases to create energy which is used on DTE's grid to power roughly 10,000 homes. According to company officials, they’ve dumped $10 million into construction to fix issues. The fixes, however, unearth smells that have caused a spike in complaints. A growing base of activists in the community don’t buy it. Arbor Hills did try to expand before. The current landfill has roughly a decade of capacity left, meaning the trash pile will continue to grow. In 2016 the same folks speaking up now formed a non-profit called the Conservancy Initiative and fought back — Arbor Hills backed down from planned expansion and stated they’d work to fix the odor issues that had become a growing concern, noting they’d go to the community and work with them when; or if, the time came to expand. The group that once beat Goliath is now growing concerned as the recent MDEQ violations pile up. Van Ameyde, for instance, questions whether sulfur dioxide is permeating homes. Those concerns include headaches and sore throats that have come along with smells from the landfill. Back in 2016 the local school board filed paperwork noting their opposition to the landfill expansion noting that kids couldn’t have recess outdoors on some days because the smell was so concerning — there are two schools within a mile of the landfill. The Conservancy Initiative, and the neighbors who are speaking out, plan to get the attention of Governor Whitmer. They say that recent moves since she’s taken office give her hope that she’ll champion issues with the landfill, but in the short-term MDEQ and ADS continue with normal procedures in terms of Violation Notices and responses. One of the most common, ongoing, issues at the Arbor Hills Landfill are the odor concerns. ADS notes that landfills will never be able to fully eliminate odors, but after a recent violation notice filed by MDEQ ADS responded saying that they have assigned a full-time compost manager to oversee the yard waste operations. According to responses from ADS, there are ongoing issues with what’s known as a “flare” which is needed to burn off excess methane gas when it can’t go to the energy plant that burns it to power up to 10,000 nearby homes. This means that when the energy plant isn’t capable of burning the gases put out by the landfill, the flare doesn’t have the capacity to burn the excess gases. An ongoing concern at Arbor Hills has to do with the amount of sulfur dioxide that is going into the air. In a violation dated February 1, MDEQ notes that ADS is attempting to get permission from the EPA to increase the limit of SO2 it discharges. The EPA sets limits for the amount of SO2 that can be discharged because it can cause coughing, throat irritation and breathing difficulties for some people — especially those that are sensitive to air quality such as people with asthma. High concentrations of SO2 can affect lung function. A recent violation cited ADS for having too much leachate on-site. Leachate is essentially the “garbage juices” that come off landfill sites. Landfills are supposed to keep the amount in specific areas within allowable levels/amounts. Since the violation, 7 Action News has been told, that ADS is working to extract and discharge leachate in a way that is MDEQ compliant — they note that the issue was with a specific section of the landfill, not the entirety of the facility.